Kate Middleton, Prince William Join Royal Family for Sandringham Christmas Service: Where Were Prince George and Camilla? The Royals go to church! Kate Middleton and Prince William attended Christmas service at St. Mary Magdalene Church in Sandringham, on Thursday, Dec. 25, but several prominent members of the royal family were missing for the special occasion. It was rumored that baby Prince George would be attending the service, but palace officials said it would be highly unlikely, adding that most children usually attend starting at the ages of 4 or 5. According to a source, the adorable 17-month-old tot went to church last Sunday, Dec. 21, where he attended a candlelit service at Anmer Church with his parents. Along with little George, his step-grandmother Camilla Parker Bowles was also unable to attend the service with the family due to a health issue. "The Duchess put her back out earlier in December and has been in pain and is receiving physiotherapy," a Clarence House official told Us Weekly in a statement. "The doctors have advised against any travel." PHOTOS: The royal family tree! 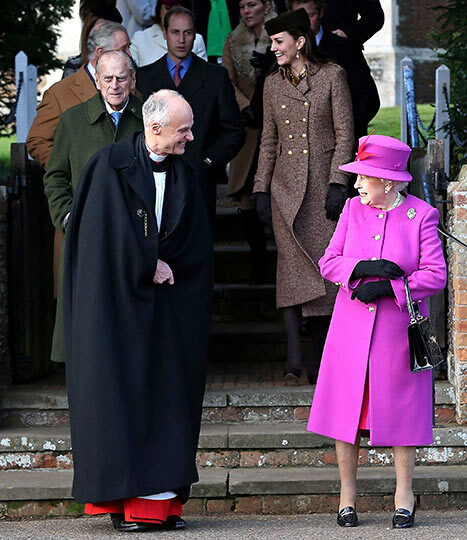 Just before 11 a.m., the Queen, wearing a bright pink Angela Kelly number, made her way to church along with other members of the royal family including Prince Harry, Prince Charles, Princesses Eugenie and Beatrice, and others. Prince William and his pregnant wife walked from Sandringham House, where they had spent the morning. 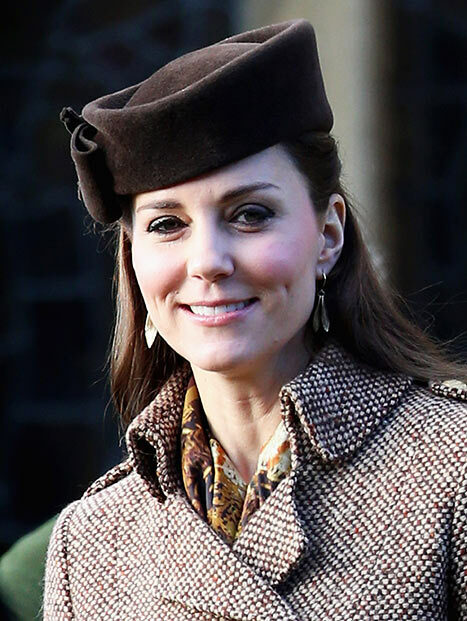 The Duchess bundled up in a stylish, long brown tweed coat by Moloh from the British brand&apos;s fall 2013 collection. The expectant-again royal accessorized her outerwear with a brown pillbox hat, matching gloves, and gold earrings. Her family — parents Carole and Mike, as well as Kate&apos;s siblings Pippa and James — also joined the royal family at the annual church service, although they were not invited for the Christmas lunch at Sandringham House. Congregation inside the church began with "God Save The Queen," followed by hymns, "Once in Royal David&apos;s City" and "O Come all Ye Faithful." At noon, the royal family wrapped up service and greeted the crowds lined up outside of the church. 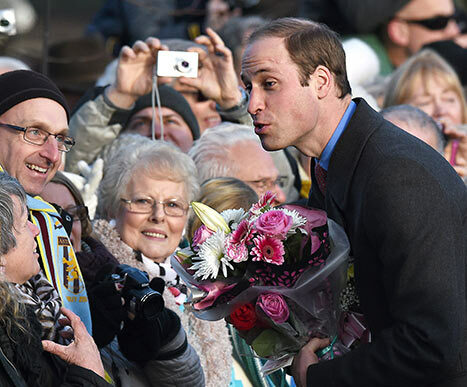 Kate was handed bouquets of flowers, and was overheard apologizing to one fan for not bringing George along. "I&apos;m sorry we didn&apos;t bring George but you would have heard him in the church," she said with a smile.